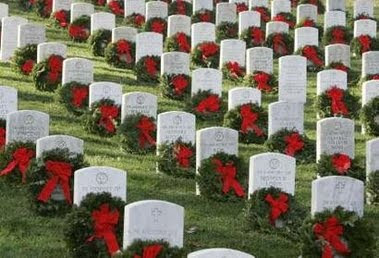 The nonprofit Wreaths Across America organization was established in 1992 when the Worcester Wreath Co. began placing wreaths on the headstones of America’s veterans at Arlington National Cemetery. By last year, similar ceremonies were taking place in more than 300 locations across the nation, plus two dozen overseas cemeteries. 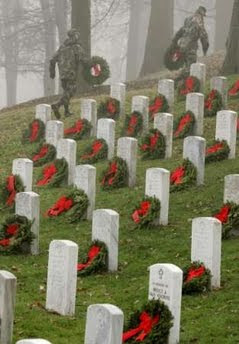 More than 60,000 volunteers participated and more than 100,000 wreaths were placed on veterans’ graves in 2008. 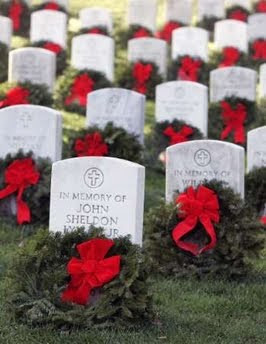 The event is held each year on the second Saturday of December, and I think it's a beautiful way to acknowledge all that our servicemen and women have sacrificed for us, including being away from their families holiday, after holiday, after holiday. Thank you to my friend Dwight, our friend Jenny's husband Jeff, my dad, and all of my dad's "EMS Boys," to all who have served our country and come home, and to all who served and never made it back. It is an honor and a privilege to know you all. Merry Christmas and may God bless you richly in the new year! Beautiful...I know they did that near here too. I wish I had a chance to see them, but now we are snowed in so I don't think I'll be going there anytime soon! But thanks for the reminder! This is absolutely beautiful and heart-wrenching at the same time. I've never heard of this organization, but am bookmarking their site right now. So pretty. We are so thankful for our service men and women. Absolutely gorgeous. We are so thankful to all those who serve(d) to protect our freedoms! Thank you for sharing.